All products used are Stampin' UP! unless otherwise stated :o) The image has been coloured with Promarker pens. Teri this is ADORABLE love those teddies with a balloon wonderful colors too!!! oooooooooooh how precious! adorable and wonderfully done. I love it! 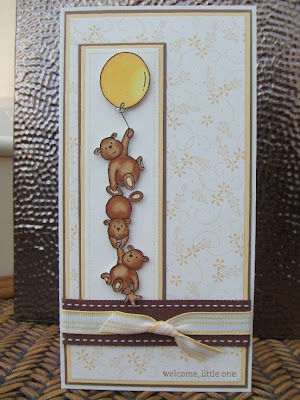 the bears, ribbon, balloon and the paper. and the cute sentiment in the lower right hand corner. absolutely precious! I have left something for you this time on my blog . . .
Awww...how cute is this! Your teddies are totally gorgeous! Awesome! I love the softness of yellow and the pop of brown. Gorgeous take on the sketch! This is sooooo sweet!! What a gorgeous image, coloured so beautifully. Teri this is adorable! I just love those little bears. They make me smile. So glad you could play along with us. What a well made and ADORABLE little card! Those bears are outrageously cute! Great job!